HOLLYWOOD, Calif. � Hailed as "tonally flawless" (Wall Street Journal) and "one of the flat-out funniest films in ages" (Los Angeles Times), the "hilarious" (Vanity Fair) mockumentary What We Do in the Shadows debuts on Blu-ray and DVD July 21, 2015 from Paramount Home Media Distribution. Written and directed by Jemaine Clement ("Flight of the Conchords") and Taika Waititi (Eagle vs. Shark), the film is a smart and witty send-up that follows an endearingly unhip quartet of vampires. Winner of the Toronto International Film Festival Midnight Madness People's Choice Award, What We Do in the Shadows was also an Official Selection at the Sundance FiAlm Festival, the Berlin International Film Festival, and more. Viago, Deacon, and Vladislav are vampires who are finding that modern life has them struggling with the mundane�like paying rent, keeping up with the chore wheel, trying to get into nightclubs, and overcoming roommate conflicts. Featuring an outstanding ensemble cast and "comic acting of an extremely high order" (Wall Street Journal), What We Do in the Shadows is an original and wildly entertaining comedy. 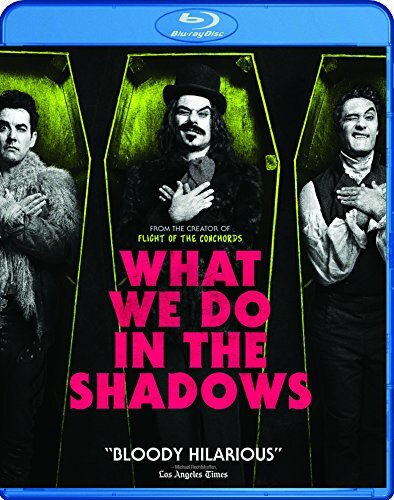 The What We Do in the Shadows Blu-ray features more than two hours of uproarious bonus material including commentary by Jemaine Clement and Taika Waititi, behind-the-scenes footage, deleted scenes, video extras, interviews, promo videos and a poster gallery. The film will also be available as a single disc DVD. The WHAT WE DO IN THE SHADOWS DVD is presented in widescreen enhanced for 16:9 TVs with English 5.1 Dolby Digital and English subtitles. The DVD includes the feature film in standard definition. Paramount Home Media Distribution (PHMD) is part of Paramount Pictures Corporation (PPC), a global producer and distributor of filmed entertainment. PPC is a unit of Viacom (NASDAQ: VIAB, VIA), home to premier media brands that create television programs, motion pictures, consumer products, and digital content for audiences in more than 165 countries and territories. The PHMD division oversees PPC's home entertainment and transactional digital distribution activities worldwide. The division is responsible for the sales, marketing and distribution of home entertainment content on behalf of Paramount Pictures, Paramount Animation, Paramount Vantage, Paramount Classics, MTV, Nickelodeon, Comedy Central and CBS and applicable licensing and servicing of certain DreamWorks Animation titles. PHMD additionally manages global licensing of studio content and transactional distribution across worldwide digital distribution platforms including online, mobile and portable devices and emerging technologies.